Outfit: I run through the world thinking about tomorrow. My last outfit post for this year is a casual boho grunge combo I loved to wear two weeks ago when the weather was very warm for the winter months. 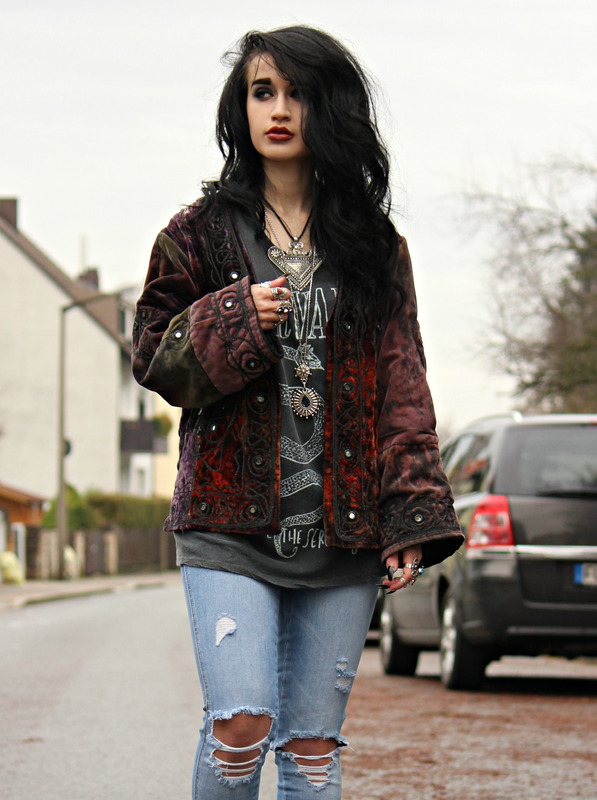 I'm wearing a vintage tie dye velvet jacket with embroidered and mirrored details, isn't it cool? I bought it secondhand from eBay, sometimes you can find some real bargains and edgy pieces there! I combined it with one of my favorite band tees (I love the snake print! 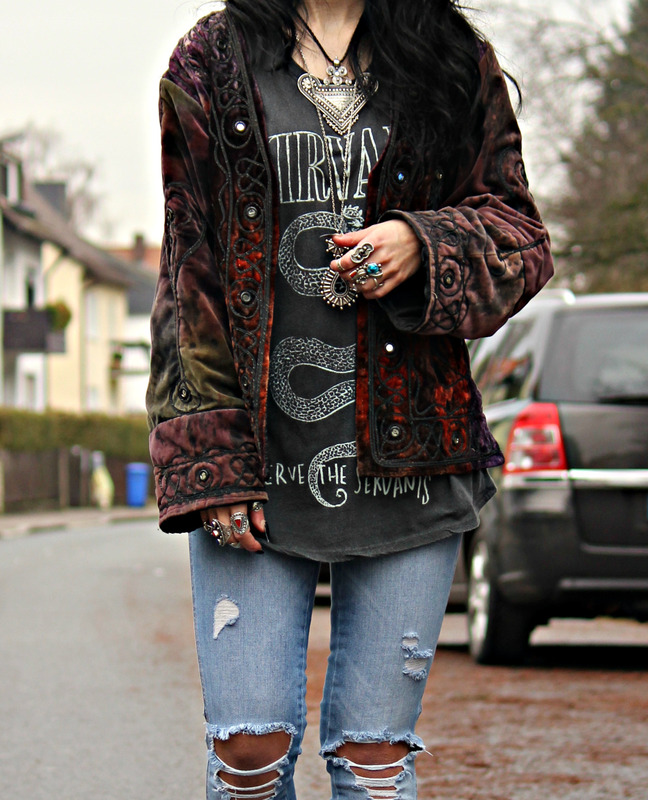 ), some ripped denim jeans in a blue vintage wash and the most comfortable platform boots ever. I really dig this outfit, it's so comfortable! Sooo tomorrow is the last day of 2015, are you excited for 2016? I am and I am also glad that 2015 is finally over. It wasn't my year to be honest and I'm looking forward to all the beautiful moments which will hopefully occur in 2016. For this Monday I show you a very 70s inspired look which could also have been worn at Woodstock back in 1969. I received this stunning embroidered maxi dress from Romwe lately, it got a gorgeous light pink tone and a delicate embroidery on it. It's also so soft because it's made of cotton and I really can't wait to wear it a lot when it's finally getting warmer again. I really like its High-Low fit which makes it even more flowy and versatile. 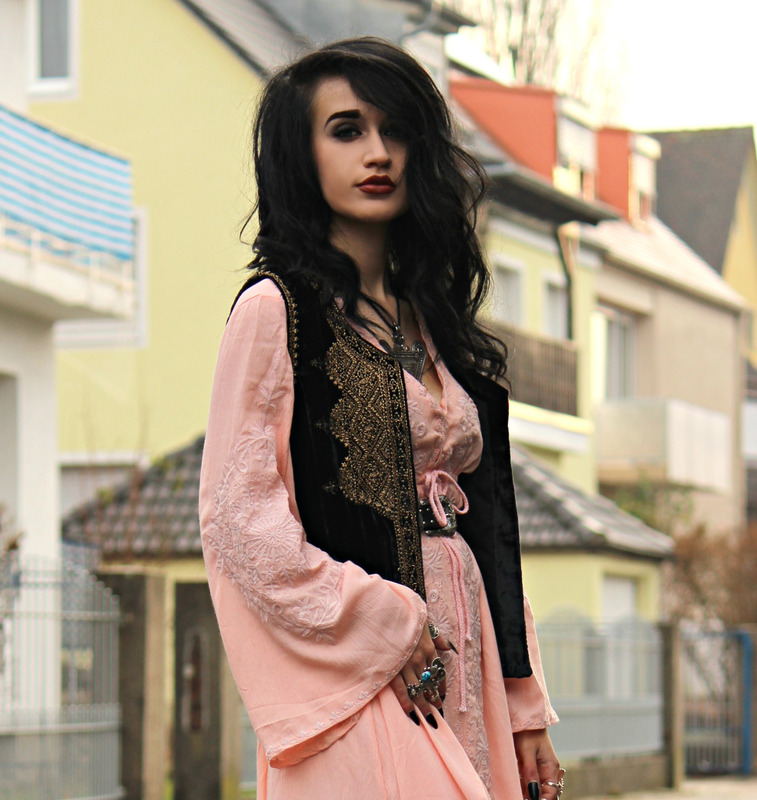 I added my embellished velvet waistcoat I got on sale at Zara a few months ago in order to make the outfit a bit more interesting and vintage looking. There is no better piece for layering than vests. They literally go with everything and make every look more interesting. Furthermore I added my studded western belt, cowboy boots and my new indian silver pendant I bought from a vintage shop. Isn't it perfect? I really love the pendant, it's become one of my favorite necklaces I've been wearing all day lately. I love its arrow design and beautiful details. For this year's Christmas holidays I wanted to post a very special outfit which does not only include some of my all time favorite clothes, I also want to embrace the festive vibes. So I guess there's no better day than today to show you one of the most gorgeous coats I've ever owned. I ordered this dark green velvet beauty a few weeks ago after I saw it on instagram. Yep, it blew me away at first sight! I'm so glad I was able to get my hands on it as soon as it dropped online. It's no secret that velvet has been one of my favorite fabrics. My collection is constantly growing, you can never have enough velvet in your closet! I immediately loved the golden embroidery on the dark shimmery green ground, it's duster style and fit in general. It expresses what all your 70s boho coat dreams are made of! Somehow I prefer buying vintage clothing lately, because there are more edgy pieces nobody else has and mostly the quality is much better than mass productions nowadays. Plus vintage pieces from the 70s obviously really got the amazing 70s feel. Because the winter has been so warm lately here in Germany I already wore this coat out a multiple times. Do you know those pieces which will bring you joy every time you wear them? This velvet duster is one of them and it's definitely a lifetime keeper. I combined it with my lace Free People dress I bought a few years ago and some golden tribal layered necklaces. I think white lace looks the best with the green tone, it highlights the vintage feel, too! I hope you've all been enjoying beautiful relaxing christmas holidays with your loved ones! For this Wednesday I went for a rocker chic outfit with lots of golden accessories. I got the grey coat from Wholesale Buying a few weeks ago, it's a really versatile piece which can be dressed casual, business like or chic just depending on how you combine it. You all know typical business outfits are impossible to find on my blog, so it's no big surprise I created a Rock 'n' Roll / biker inspired outfit with some boho vibes - 100% my way and style. Because the coat is grey and pretty basic looking I wanted to bring in some color with my printed harley davidson shirt. Its golden+orange tones on black ground match perfectly the purple color of my velvet high-waisted shorts I got on sale at a Topshop store a few years ago. I decided to go for some fishnet style patterned lace tights to complete the outfit - those add some edge additionally. Last but not least I'm wearing my beautiful Tharu necklace which I recently bought on etsy. It's an ethnic vintage piece from the 70s I really love! It's become one of my favorite necklaces, it's such a beauty. I'm also wearing some colorful tribal bracelets, rings, my golden/silver belt which was a bargain from a secondhand shop and my beloved platform boots. Tomorrow it's finally CHRISTMAS EVE! I hope you all have beautiful and relaxing christmas holidays with your family! Merry Christmas, lovers!!! Outfit: Riders Of The Storm. Outfit: Gimme All Your Lovin'.